Easy OPC Trender is an intuitive and powerful OPC Trending Client. Transform your OPC HDA data into knowledge that can be used to improve processes and increase operational efficiency. With OPC-HDA, you can connect to any process historian data source. 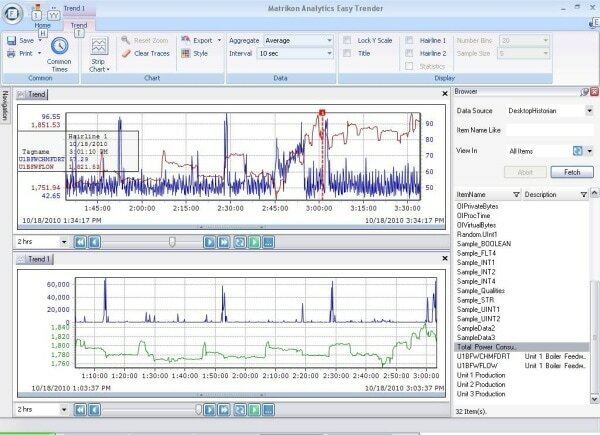 Easily create trends to analyze product quality and system performance. Easy OPC Trender is so easy, you’ll be up and running in less than 5 minutes. Easy OPC Trender’s Workspaces make it easy to stay organized with mountains of information. Save trends to avoid hunting files. Save tags for instant access to your most commonly used tags. Save timestamps for important incidents, golden batches, and common timeframes. No dialogs are required to access your (OPC-HDA) process and equipment data. Just drag and drop from the tag browser directly into a trend window. Easy OPC Trender’s intuitive interface makes most common functions only a click away. With Easy OPC Trender, comparing data from multiple time ranges in the same window is simple– making batch compare and incident review a snap. 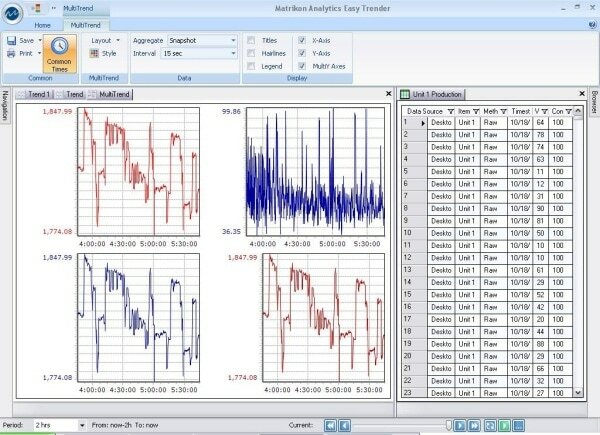 Easy OPC Trender has multiple views for your OPC HDA data: Strip charts, X-Y, SPC, Histogram, and more. View your data the way you want with Easy OPC Trender’s advanced trending algorithms. Sometimes one trend is not enough. Easy OPC Trender’s Dashboard Overview gives you the ability to see up to 25 trends in a grid at a glance. OPC is the most popular method for accessing industrial automation data. With OPC HDA access, Easy OPC Trender enables you to pull data from multiple process historians and databases using OPC, without relying on custom tools for each system. Compare data from separate lines, units, or plants, all in a single tool. Benchmark current performance against ideal past performance. Easily create relational trends by comparing large amounts of data from your relational database, or batch trends by comparing non-continuous time ranges, series, and overlays. Easy OPC Trender even allows independent adjustments of time ranges. Easy OPC Trender allows you to display multiple data series from multiple sources on the same trend with more than one axis. Because each series of data has its own axis, Easy OPC Trender lets you move any of your data series anywhere on the page, independent of other data series. 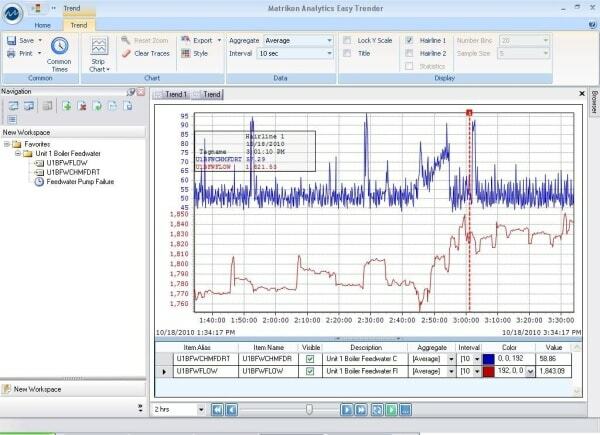 Multiple Axis trends can be easily configured to accommodate the different axis. Trend cursors display the exact tag value and time at the point where the cursor intersects each series. This cursor can be dragged to any point on the trend. You can place multiple trend cursors on a trend. Zoom in to view a smaller portion of the trend in more detail and zoom out to the original view of the trend data anytime. Move the trend view to display a different portion of the trend using Panning Trends.